The same day as Etana released her new album Reggae Forever another superb Jamaican songstress dropped a new album. I’m talking about Diana Rutherford – daughter of singer Michael Rutherford – who is not as well-known as Etana, but both have truly powerful voices. Better Days is her second album and the follow-up to Ghetto Princess released in 2011. The sets don’t have much in common musically, other than Diana Rutherford’s voice. Where Ghetto Princess was urban and R&B-oriented, Better Days is traditional reggae with grand arrangements and an organic feel thanks to the recording process and live instrumentation. Diana Rutherford sings with the attitude and confidence of diva. Listen to a cut like Strong Black Woman, especially the two last minutes, or the version of Jackie Wilson’s soul standard (Your Love Keeps Lifting Me) Higher & Higher. The standout track is however the uplifting and gospel-infused Smile On My Face. Better Days might have an audio quality slightly below par, which is unfortunate since it’s a very mature and sophisticated set. And if your curious about the recording process – check this documentary on Youtube. There have been several well-compiled compilations dedicated to Jamaican producer Winston ”Niney” Holness aka The Observer. Niney The Observer – Roots with Quality, Blood & Fire – Hit Sounds From The Observer Station 1970-1978 and Observation Station should belong in any record collection. 17 North Parade – a subsidiary of reggae giant VP Records – has now issued a new box set dedicated to this hard-edged and uncompromising producer. 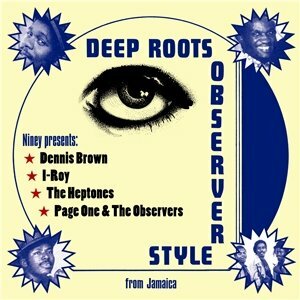 Deep Roots Observer Style includes three previously released albums – Dennis Brown’s Deep Down, The Heptones’ Better Days and its dub companion Observation of Life Dub – along with a compilation of I Roy singles titled The Observer Book of I Roy. Niney got his big break in the early 70’s with roots masterpieces such as Max Romeo’s Rasta Bandwagon and The Coming of Jah as well as his own haunting Blood & Fire. His production style is the essence of rebel music and is often sparse with a brimstone and fire kind of feeling. This style suited the late Dennis Brown very well and some of his best material was recorded for Niney. So Long Rastafari and Open the Gate are two sublime vocals included on the Deep Down set, actually one of Dennis Brown’s earliest roots albums. The Heptones’ Better Days has Naggo Morris instead of Leroy Sibbles on lead vocals and was originally put out in 1978. It contained ten tracks – among them the sublime God Bless the Children – but this version is strengthened by five roots anthems. Through the Fire I Come and Temptation, Botheration and Tribulation are two of the best conscious tunes ever voiced by the trio. The dub counterpart to Better Days is a lethal drum and bass deconstruction and even though Niney is most well-known for producing singers rather than deejays he managed to capture I Roy in his essence with tunes such as Jah Come Here and slack Sister Maggie Breast. Deep Roots Observer Style drops on February 13th and the CD version includes an eight page fully illustrated booklet with liner notes courtesy of Harry Wise.